It had been awhile since I took a road trip to Phoenix (four month, exactly) so I packed up all my dirty laundry and some work clothes and made the drive one Sunday afternoon. To my surprise, just outside the city limits, I thought I saw something forming alongside the freeway. Was this a haboob? The storm was spread out in a long line, parallel to the freeway, and I thought I could almost outrun it and get in front. Alas, I decided to pull over at a gas station, since one happened to appear in the middle of nowhere. Just as I turned off the freeway, I ended up straight in the dust. 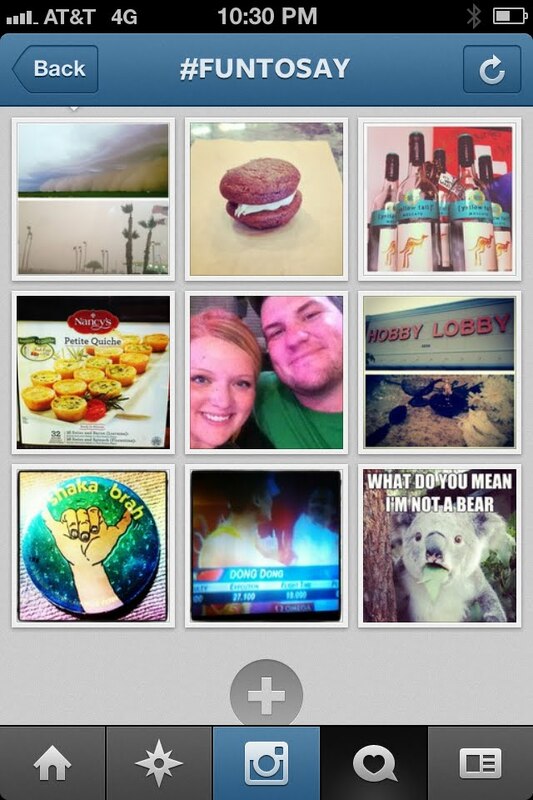 I tagged a haboob photo on Instagram with #funtosay. There are lots of other things that are fun to say! Whoopie pie! Petite quiche! Hobby Lobby! Once the haboob passed, I got back on the road, only to find a torrential downpour and I couldn't see a thing. I pulled over again and waited that out. Finally, I made it to Phoenix. I pulled into Meghan's house and started to unpack. Monday was a solid day of work. During the week, I would realize that I am starting to crave a better work routine. Enough to give up working from home? I don't know yet. But it weighs on me. Meghan and I had an eventful evening trying to install internet at her house (she didn't know if she had DSL or Cable, and had all the wrong cables for whichever option it was), with three trips to Target that night, and one major social networking scare in which we thought one of her work clients had gotten hacked by adult video spam, which would've been the worst news ever. Thankfully, just one guy's Facebook page got hacked, and made it look like other pages were hacked, too. We had a fun half hour trying to figure that out. Somewhere in all of that we made spaghetti squash. And I got caught up on my September issues. Next day after work, I visited the magical Damian for a hair update. Cut and color. Then Megs and I had dinner at Tuck Shop, which I absolutely love. We had shrimp & okra, Brussels sprouts, mac and cheese, and a salad. It was way too much food. The next day, I had Sonic. Vanilla Dr Peppers cure allergies. Or so I had hoped. I was sniffling and itching my eyes at this point in the week. Wednesday meant a move to Chantal's house, and we had Indian food while catching up on life. Thursday night kicked off my birthday celebrations. Marcello flew into Phoenix, and we went straight to one of my favorite places, LGO, where many of my friends had gathered to dine and celebrate with me. Dessert stop at the Grocery. And finally the nights had cooled off enough to hang outside. More birthday fun stuff to come! I love fiscal responsibility. I love when people mention it and show how it plays a role in their lives. Thank you for improving my day!